Computer engineering deals with the design of computer systems and applications. In general, computer systems include microcomputers, database systems and networks of computers. The best example is personal computers (PC), which are the most commonly used computer systems. We encounter computers almost in every part of our lives including healthcare, mobile phones, cars, airplanes, ATM and smart cards. Computer engineers have both the knowledge of hardware and software. In reality, hardware and software are very closely related. Hardware cannot function without software and software requires hardware to be carried out. Computer engineers combine the hardware and software together to implement complicated design problems with cost and performance in mind. Computer engineers play an important role in designing, implementing and maintaining the computer-based systems by using their hardware and software knowledge that they received through their education. 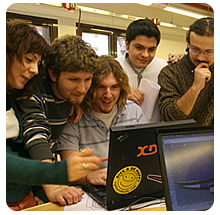 With these facts in mind, the undergraduate program of Computer Engineering at Izmir University of Economics provides a balanced education between hardware and software. The courses in computer science and other fundamental engineering courses related to mathematics and applied sciences, as well as courses related to humanity and social sciences, economics, administration and a variety of other elective courses provide an education with strong foundations for our students.